Από την παιδική ηλικία και σε όλη τη διάρκεια της ζωής μας οι τροφές συμβάλλουν σημαντικά στην επιβίωση, την υγεία, τον ρυθμό γήρανσης και τη μακροβιότητά μας. Οι τροφές είναι ουσιαστικά ένα σύνολο χημικών ενώσεων μεγάλης πολυπλοκότητας που εισέρχονται στα κύτταρά μας, μεταβάλλοντας τη σύστασή τους και καθορίζοντας την ενεργητικότητά τους. Dr Matina Chronopoulou was born in Sparta Greece. She was raised in a family whose herbal knowledge went back three generations. She comes from a family of Traditional Healers, midwifes and herbalists. Hippocrates’ simple quote of “Let food be thy medicine, and medicine be thy food” set her on a journey to study nutrition and naturopathy. Her holistic health search is not only a personal journey, but one to seek information that can be shared with those who also desire to learn nature’s secrets of achieving health and wellness in their life naturally. Dr Chronopolou is a practising Naturopathic Doctor, Homeopath, Acupuncturist, and Bioresonance Therapist. 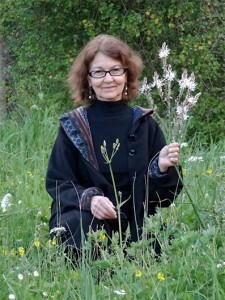 She has been involved with natural therapies since the late 70s. Since 1995, she has run the Centre for Natural Medicine and Acupuncture, in Athens Greece, focusing on naturopathic therapeutics, nutritional medicine, lifestyle modification, botanical medicine, homeopathy, acupuncture, flower essences, and energy medicine. She lectures and teaches when not seeing clients. She specializes in educational workshops and seminars for professionals sharing her knowledge on the traditional mediterranean healing diet, herbal walks and herbal retreats in the Greek countryside. She has presented scientific papers around the world and has contributed regular articles to natural health magazines, newspapers, television and radio talk programs over the past twenty five years. Most recently, she is a columnist for the Huffington Post. Dr. Chronopoulou is the Director of Naturopathy and Complementary Medicine at Warnborough College.